A lack of self-confidence stops many people from reaching their true potential. Hypnotherapy changes patterns and beliefs allowing people to do things that previously would have been out of the question. A one to one session of Hypnotherapy identifies and rectifies any self-doubting, boosts self-esteem thus helping you to move forward with improved self-confidence in any situation. By improving your confidence it leaves you ready to get on with living and feeling good about yourself. Most clients need two to three sessions for confidence issues. The 'Build confidence and self-esteem' hypnosis recording or MP3 download is designed as a complete course to use in the comfort and privacy of your own home. One to one hypnotherapy appointments are tailored to deal with individual issues to suit each clients requirements. I like to move people on as quickly as they can safely make the changes so most people have 2-4 sessions although some have a few more. I try to keep it to a minimum, teaching the client what to do so they can get on with things themselves. "Since the sessions, I have had a promotion at work which is a direct result of the hypnotherapy." "The speech went brilliantly. I had so much confidence I was asked afterwards how long I had been doing public speaking. As you know it was my first one." "I just wanted to let you know I was awarded a prize for the most confident employee! The difference in me is great." "Hypnotherapy has given me the strength to face my divorce, I know it will all be fine now as I have the energy to deal with it. Hypnosis downloads and techniques are all helping me feel calmer and look forward to the future not dwell on the past." "Surprisingly I survived the flight quite nicely, I wasn't scared!" "I no longer blush which use to be embarrassing. 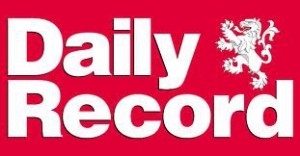 It is a relief and it was so easy with just 2 hypnotherapy appointments." "Much happier, more relaxed. I use the techniques for meetings and feel really confident - excellent. thanks." 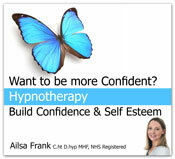 Or book a one to one hypnotherapy session with Ailsa Frank to work through confidence issues specific to yourself.